Fall Creek Falls received a 5 rating ... and in retrospect that may be a little harsh. Anyway the waterfall isn't more than a 6.0 on my scale. It is a very nice area but overall the flow is low compared to many. Don't get me wrong. I would visit this waterfall again. It just doesn't rate very high compared to the larger, grand waterfalls of Tennessee and the West. The waterfall is right next to the highway but impossible to see in the summertime without a short, steep hike to the base. I'm very curious to see this waterfall in the Spring with more flow and intend to return. 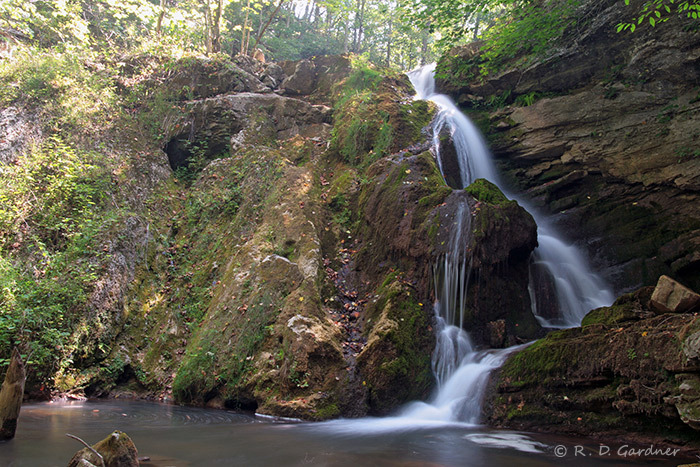 Also nearby is the Hanging Rock Recreation Area which contains both the Upper Little Stoney Falls and the Middle Little Stoney Falls. From Dungannon, VA, take US-65 North/East for about 1 mile to its intersection with Route 774 (on the right). Turn right onto 774 and immediately park on the left side of the road. From where you park the waterfall is across 774, down a very steep hill, and slightly to the left. You will hear the waterfall. 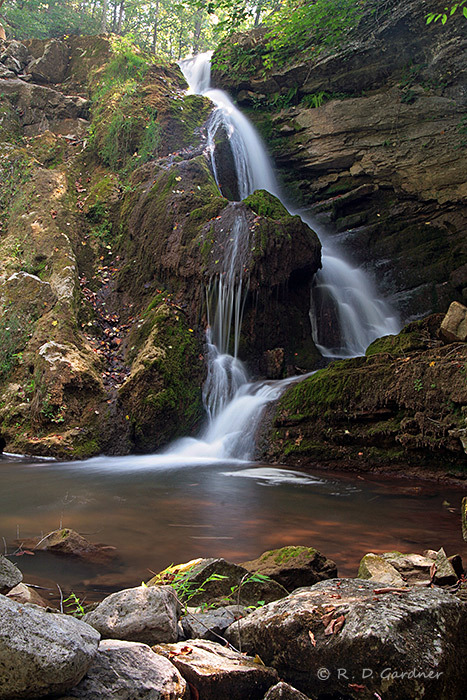 Use the following link to	customize your own directions to Fall Creek Falls. It's a doable but dangerous scramble down to the base of the hill. There is a 4-wheeler trail but I didn't follow it and don't know where it comes out. Also, it is probably on private property so try to find the owners and ask permission before going to the waterfall. They can probably give you directions to the 4-wheeler trail which would make this an easy hike. There's a lot of room at the base of the falls but most of the views are partially blocked by foliage. If you want foliage in the foreground you're in good shape. Otherwise your compositions will be somewhat limited. I can see Fall Creek Falls having some super lush, vibrant, green moss in the Winter and Spring. Even with the drought the colors were pretty decent. Use a polarizing filter for sure to help with glare on the water and moss. It will really help with the greens. The time of day was around 12:30 pm. You can see in the waterfall photos that the area above the waterfall washed out a bit due to the high contrast conditions. Still, the area was generally shady. For mid-day the conditions were good. For best results I would target within 3-4 hours of sunrise. Because the waterfall is on a north face it will be shady all day in the winter time. 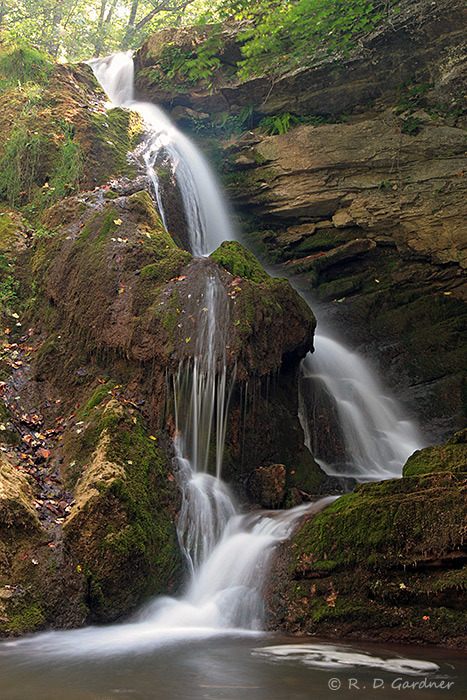 This waterfall, like many others, also begs for the silky smooth look. Yes, I think a tripod is necessary. Fall Creek Falls, Scott, VA from Randy Gardner on Vimeo.